Moroccan Couscous with roasted vegetables and chickpeas. A tasty, spiced Moroccan couscous recipe packed with North African flavours. This Moroccan couscous recipe is something I have been making for ages. It’s packed with roasted veggies and chickpeas and has all the flavour of the Middle East. We like to have this for lunch or as a side dish. It’s perfect for taking to picnics, potlucks or BBQs. It’s great warm but can be eaten cold too. This couscous recipe is accidentally vegan, it wasn’t planned to be vegan, we just like it as it is. Of course, you can add in feta or halloumi to this if you wish, both are great in this dish. So for this couscous, I roast up some butternut squash with red onions, pepper and zucchini/courgette. You can easily add more veg in here if you want. The spices in this are warming and flavourful yet are mild enough so the kids can enjoy this too. Roast the veggies. Add all the vegetables except the zucchini/courgette to a large roasting tray, cover the veg with the olive oil. Add a little salt and pepper then roast for 20 minutes. After 20 minutes add the zucchini to the tray, give the veggies a stir then roast for another 20 minutes. Make the couscous, add the stock to the couscous, stir well. The couscous should absorb all the stock. Cover the couscous with clingfilm or something similar and leave for about 10 minutes. Make the dressing, add all the spices, garlic, lemon zest and juice to a small bowl and stir. Whisk in the lemon juice and extra virgin oil to the spice mixture. After 10 minutes, remove the clingfilm from the couscous, scrape the couscous with a fork until it’s separated and fluffy. Add the chickpeas. Pour the dressing into the bowl. Then add all the roasted veggies and the apricot and mix well. Finally, add the herbs and mix well again. I like to serve this in a large serving dish, I add blanched almonds and pomegranate seeds just before serving. This is a great dish for putting in the middle of the table so everyone can help themselves. It’s a great side dish, serve it with some grilled halloumi, baked feta, or with a vegetable tagine. Or have it on its own, I like to make this for school lunches or as a pack-up for a road trip. Yes, you can. You can roast the veggies the day before, keep them in the fridge and reheat them before you add them to the couscous. If you are serving this cold then you won’t need to reheat them. The dressing can also be made the day before, just keep it in an airtight container in the fridge, give it a good shake before adding to the couscous. I prefer to make the couscous fresh, it’s so quick and easy to make so I recommend making that fresh. How Long will this Couscous Salad Keep? 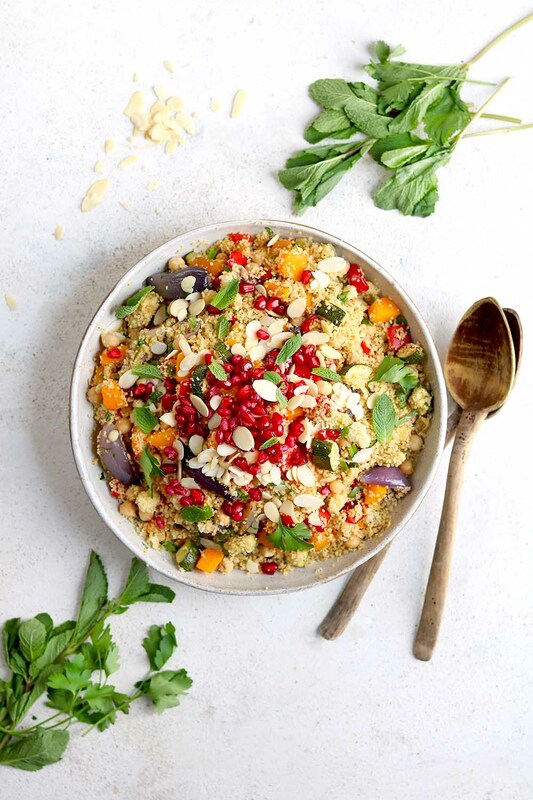 This Moroccan Couscous Salad will keep in the fridge for two days. Normally couscous without any extras added will keep in the fridge for three days, however, due to the added veggies and herbs, I would only keep this for a day or two. If you’re serving this at a potluck or BBQ this will be ok to leave out for a couple of hours. Can I Freeze this Couscous Recipe? You can freeze the cooked couscous if you wish. I wouldn’t freeze the finished dish due to the roasted vegetables. They would definitely change texture and could become mushy once defrosted and reheated. To freeze the couscous, leave it to cool then add it to a freezer bag, work any air out of the bag then freeze for up to a month. Thaw in the fridge overnight then heat in a hot skillet until piping hot. Then add your roasted veggies, herbs and dressing. Moroccan Couscous with Roasted Vegetables. Moroccan Couscous with roasted vegetables and chickpeas. A tasty, spiced Moroccan couscous recipe packed with North African flavours. Great for lunch or as a side dish. Preheat the oven to 392F / 200C. Add the butternut squash, red onions and pepper to a large baking tray. Season with salt and pepper and drizzle over 1 and a half tablespoons of olive oil. Toss the vegetables then bake in the oven for 20 minutes. After 20 minutes remove the tray from the oven then add the zucchini/courgette. Toss all the vegetables together then return the tray to the oven and bake for a further 20 minutes. The vegetables should be soft and slightly charred on the edges. While the veggies are roasting, make the couscous. While the couscous is doing its magic and the veggies are roasting, make the dressing. Add all the spices, lemon zest and lemon juice to a bowl, whisk in the 1/4 cup of extra virgin olive oil. Set aside until you are ready to use it. When the couscous is ready, use a fork and scrape the couscous to loosen it up. It should be nice and fluffy. Now add the chickpeas and the dressing to the couscous, stir well. Add the veggies and the chopped apricots and stir again. Finally, add the herbs and mix well. Season with salt and pepper to taste. Serve with blanched almond slivers and pomegranate arils/seeds. Nutritional information is approximate and is provided by an online too. Calories are based on serving 6 people. Stock I used a low sodium vegan bouillon to make the stock for this, if you want to keep this vegan please read the labels on your stock, not all vegetable stock is vegan. Also, a low sodium stock is essential, a regular stock will make the couscous too salty. Couscous For best results leave the couscous to soak up the stock for 10 minutes, always scrape your couscous with a fork to get that light and fluffy texture. Couscous is made from durum wheat, therefore, is not gluten-free. Spices I have made this dish suitable for the whole family, however, if you want more spice in this or more heat then I would add an extra teaspoon of cumin and maybe some red chilli flakes too. Storage This will keep in the fridge for up to 3 days, keep it in an airtight container. For freezing tips please see the post. Reheating This couscous can be eaten cold however it is best served warm. If you want to reheat it, do so on a hot skillet and make sure it is hot throughout.